The stage was literally set for this production to be right up my street: Handspring Puppet Company, whose life-size creations stole the show in The National Theatre London’s War Horse, doing Woyzeck, Büchner’s still-radical, fragmented tale of a man fighting for his sanity, using not only puppets but a set design revolving around the use of multi-media projections. Ohhhhh the disappointment! Upstage, Adrian Kohler’s large, dark backdrop with a 5 foot wall in front of it hid the puppeteers from sight whilst manipulating the puppets. This meant the space in which the action could take place was limited to a narrow balcony about 5 paces long. On all of two occasions the puppeteers ventured out from their cranny to a large dining table set downstage, and they seemed a little sheepish about it. The rest of the stage was left visible, a vast unused expanse that simply emphasized the static, stagnant, Punch-and-Judy-ness of the production. 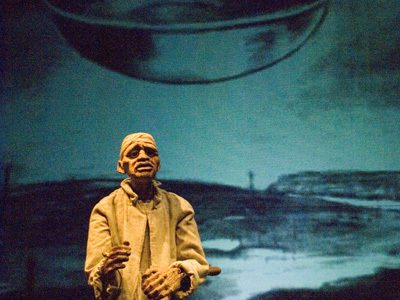 In fact, the size of the venue might well have been at the heart of the problem – it’s possible that in an intimate studio theatre, up close to the puppets and William Kentridge’s atmospheric projections, the performance wouldn’t have left me quite so cold.